The file consist of 1 page affidavit stamp form for transfer. This 1 page is the mutation transfer or ITIQAL. This property can be shifted to a name by filling in the blanks that are present on the affidavit stamp page. The attractive thing is the transfer. This makes these file easier in buying, dealing, merchandising or re-selling. By a page and sell a page. You don’t have to go on site of property right now. Dha Quetta will announce of map and balloting latter. This has happened in other Dha societies in different provinces. It means that you are “paying in advance” to Dha to provide you developed land at a “later stage”. A developed plot of 4500 feet. With roads utility facilities and complete new city. Fluctuating prices will go higher compared to other properties in a period. In other words “only few of these pages can hold huge amount of money”. They are telling every one that we are open for business. Housing schemes are very very important in Quetta. It’s a promise from a branch of state. They sign a pact that will sustain its authenticity. They write that they bound their selves to provide the land. now this is called power of the state. Its almost the same thing like a currency note or prize bond certificate. It definitely has value . like any other commodity Property of dha Quetta will go up and down. Files are been traded. There is a market for the files. There are two types of deals. Dha Quetta bulk files and retail. Single files are usually expensive than buying 5 to 10 files. The value of the files will be directly proportional to development. Lucky people may get the advantage of an unpredictable announcement. Dha Quetta files are in the market. below is a SAMPLE of the original file. ITs 2 pages of text on, 2 pages of affidavit worth 200 rupees. Later it was converted into 1 page. Undeveloped land to ______________ S/O _____________ (CNICNo: ______________) against sale of land to this authority vide Case No __/__/__. Possessor of this Affidavit File shall be fully responsible to ensure safeguards against loss/ damage/ theft DHA Quetta shall bear no responsibility whatsoever in this regard and no duplicate/ copy of this Affidavit shall be issued against loss/ theft or damage to the extent detrimental to veracity of the document. This affidavit can be verified from DHA Quetta as and when deemed necessary. 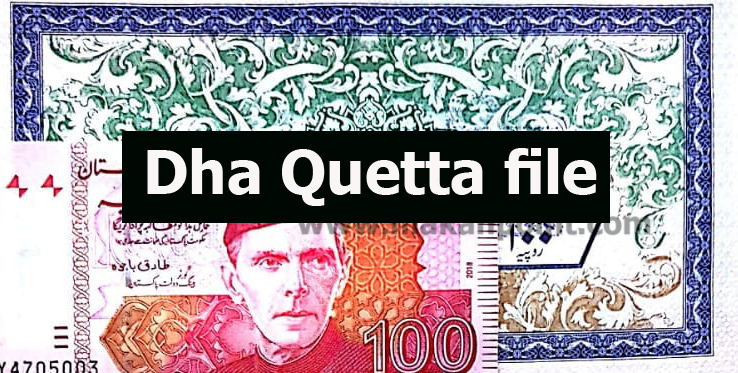 After nominating a person, the Allottee his/ her legal heirs shall be deemed to have received cost of the file and DHA Quetta shall have no liability at any stage. If at any stage the sale/ title of the land is found to be faulty/ illegal/ irregular, DHA Quetta will have the right to cancel/ withhold this plot file on legal grounds or recover the cost of faulty land from the Allottee or his/ her legal heirs as the case may be. This Affidavit should be sold/ purchased through authorized/ registered dealers of DHA Quetta. Do not remove the currency Note attached, without which the Affidavit will not be accepted. Those people who want to file their land should contact us. We help you achieve incentives. If your land exists anywhere in the locations of Dha than call us. We will send you a lot of information on whatsapp. Most people who call us are not sure if they can establish trust on the basis of internet marketing. But when they start receiving prospecting matter they remember ourname. Most people who visit our office establish trust in the first 30 minutes. Some how people are developing land and its moving toward better and better condition. Dealing in acres is a very interesting factor. its rough walkin and tough talking. We in our sphere of influence can contact and provide the right type of Local MALIK SAHAB. Kind of people who have very good reputation. We are the locals of the locations. Fore more information please call us.